Situated on the waterfront with a 466-slip marina, this four-star hotel is within walking distance to the best of downtown San Diego. 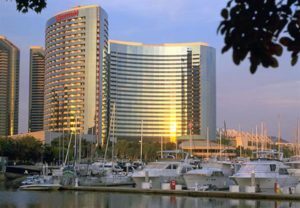 We have secured discounted rates at Marriott Marquis San Diego Marina for ContentTECH Summit. Through this website you can book, modify or cancel your hotel reservation at any time. TO BOOK MULTIPLE ROOMS, PLEASE CALL 1-866-289-8220 between 7am and 5pm Pacific time. If you have any questions, ContentTECH Summit has designated Convention Housing Partners (CHP) as the official housing company for this event. Please reach out at your leisure. *IMPORTANT* As ContentTECH Summit 2019 draws closer, exhibitors and attendees are from time to time subjected to improper solicitation from unaffiliated hotels or third-party housing agencies. Hotels listed on this website are the sole UBM-approved Hotels for the event. UBM, in our efforts to provide exhibitors and attendees with a quality event, encourages you to book your housing accommodations using the reservation phone numbers and/or links provided to attendees. Any offers from other hotels and/or housing agencies are not endorsed by UBM and ContentTECH Summit. DO NOT provide these companies with any personal or credit card information. They are NOT affiliated with the event and there is no guarantee your reservation will be made.